Businesses have overwhelmingly backed continuing the London Riverside’s Business Improvement District (BID). The BID that was first set-up in 2006 is designed to provide benefits for around 400 businesses in the London Riverside areas in Rainham funded by a levy on businesses within the BID area. Every five years those businesses have an opportunity to vote on whether they wish to renew the BID. Between 26 January and 23 February 2017 businesses could vote on whether they wished the London Riverside BID continue for another five years. 87% of the businesses who voted were in favour of BID3, the third iteration of the scheme that will run until 2022. To be successful a BID vote must see the majority of those businesses in favour and those in favour must collectively account for 51% or more of the rateable value of the businesses eligible to vote. Those voting in favour accounted for 91% by rateable value. This was the highest vote in favour of the three polls held over the last 10 years. Over the last 10 years the BID have invested the money raised through the levy on businesses in the BID area on mobile security patrols, CCTV, removal of rubbish, planting and environmental improvements, improved recycling facilities and lobbying for improved transport links to the area. In total over £2.4 million has been invested over the years in security and improving the appearance of the area. Plans during the new BID term include weekly area monitoring for maintenance, waste and cleaning issues, landscaping of key areas, working with the Council on expanding the Cleaner Air Campaign’s tree planting scheme, signage improvements, electric vehicle charging provision and the development of ultra-fast broadband coverage. The next term of the BID will also see the development of the huge SEGRO Park providing space for start-up businesses and the latest quality warehousing space. A new railway station at Beam Park will also improve transport connections. 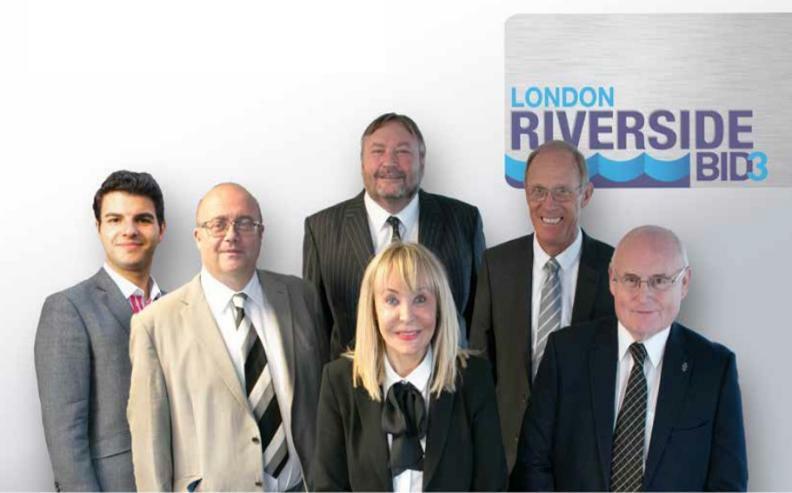 Pictured above: The London Riverside BID Board. From L to R: Cllr Osman Dervish; Ilker Dervish, Partner Comfort Zone Ltd and BID Chairman; Danny Keeble, Managing Director Keeble Paper Recycling Ltd; Maggie Dixon; Eric Mollison, Managing Director EMS Ltd; and Terry Lee, Managing Director LCS Ltd.